Fulking as a name originates from the Saxon suffix "ingas" and means "people of Folca". The village is noted for its attractive setting at the foot of the Downs and it was in Fulking that John Ruskin once enjoyed seeing the sunsets. The text comes from Psalm 104 v.10 "He sendeth the springs into the rivers which run among the hills," and Psalm 107 v.8 which reads "O that men would praise the Lord for his goodness." It appears to have lost some of its accuracy in the reproduction! 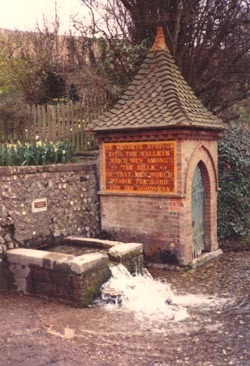 The spring flows from the Lower Chalk and Upper Greensand and in 1928 there was a ram pump to the village reservoir. The pump was located in the Victorian well house according to Howe (1958). The principal of the ram pump is that it uses the force of water to propel a small percentage of the total supply to a higher level. The reservoir overflow supplied Perching Farm and cottage. Robinson (1964) reports a non carbonate hardness of 28 ppm and a carbonate hardness of 170 ppm. A few yards up the main street on the opposite side of the road to the well house is an impressive brick and tiled public fountain, alas now dry. This is Ruskin's fountain. "TO THE GLORY OF GOD"
who brought streams also out of the rock"
Something of a mystery surrounds this inscription, both in its location and content. Howe (1958) notes that two contemporary newspaper accounts detail the inscription on the "pump house" but also suggests that the inscription may never have been put up in its entirety. (i. West Sussex Gazette 6 Aug 1896 and ii. Manchester Examiner and the Pall Mall Gazette printed just after Ruskin's death) The reason for this supposition is a letter from Ruskin dated 16th June 1887, to his friend Willett who composed the inscription. "Dear Willett: Sincere thanks for your kind note and message from Dr Wendell Holmes, but I am too sad and weary just now to see anything, and I was grieved by your inscription on the fountain, for it made my name far too conspicuous, nor did I feel that the slightest honour was owing to me in this matter". An alternative possibility is that much of the inscription was removed or concealed after Ruskin's death in respect of his wishes. This would explain why Axiom was able to report a tablet in 1897, three years before Ruskin died. A substantial area of plain red tiling may well have been where the original inscription was intended. If this is so the suggestion, noted by Howe, that the inscription was on the pump house where the ram pump was located, by the sheep wash, is misleading. The inscription "To the Glory of God" suggests that the remainder of the Ruskin inscription was on the public fountain and it may be that it still exists behind the tiles. Behind the fountain and spout there is a substantial chamber measuring about 3 metres high, 3 metres in depth and 2 metres in width. The chamber is built of brick and barrel vaulted with an access trap in the top. In the chamber there are assorted pipes and valves in a state of dereliction. The chamber is similar to cisterns behind public spouts found elsewhere. West Malvern has a comparable structure, dated 1844, which acted as a storage tank for the public spout. It may well be that the chamber at Fulking was the village reservoir or just a valve chamber linked to the ram pump. Also adjacent to the spout is half of an iron plate with a partial inscription which once read "C A Wells, Engineer, Lewes" The spout when running flowed into an open gully which in turn supplied an animal trough a few feet away. Unfortunately all is in a sorry state of repair. Ruskin's fountain is a classic example of Victorian neo gothic exuberance, a style which subsequently became less fashionable, although with the revival in interest for Victorian architecture should today be considered a treasure of great value. a perpetuation or even enhancement of the class structure status quo. At the other (eastern) end of the village, beside the road are two iron pumps, one either side of the road. One is marked with a small plate "C A Wells, Engineer, Lewes" This company once operated the Etna Iron Works at Eastgate Wharf, Lewes. A similar pump is sited in a nearby garden. Also in a nearby garden is a well and bucket. There is also a set of springs south-west of the hamlet (Water Supply of Sussex 1911). Axom L. 1897, Bygone Sussex, p142. Edmunds F H. 1928, Wells and Springs of Sussex, Geological Survey Memoirs, HMSO, see IV/3. Howe F A. 1958, A Chronicle of Edburton and Fulking, Hubners, Crawley, p62. Robinson et al. 1964, Records of Wells in the Area of the New Series One-Inch (Geological) Brighton 318 Sheet, Geological Survey, Dept of Scientific and Industrial Research. Weaver C. Osborne B. 1994, Aquae Malvernensis, Cora Weaver, p46/7.